Marry Me is the debut studio album by American musician St. Vincent. It was released on July 10, 2007, in the United States and on September 3, 2007 in the United Kingdom, through Beggars Banquet Records. The album is named after a running gag from the television show Arrested Development. As of 2009, the album has sold an estimated amount of 30,000 copies. All tracks written by Annie Clark, except where noted. 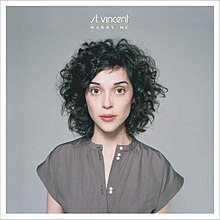 ^ "Marry Me - St. Vincent". Allmusic. Retrieved 13 February 2016. ^ "St. Vincent Strange Mercy". Slant. Retrieved 19 February 2016. ^ "St. Vincent, 'Actor'". The Boston Globe. Retrieved 13 February 2016. ^ "St. Vincent: Strange Mercy". Pitchfork. Retrieved 19 February 2016. ^ "Marry Me Reviews, Ratings, Credits and More at Metacritic". Metacritic. CBS Interactive. Retrieved 2012-04-24. ^ Turnbull, Stuart. "BBC – collective – st. vincent 'marry me' review plus full tracks". BBC Collective. Bbc.co.uk. Retrieved 24 April 2012. ^ Cinquemani, Sal. "St. Vincent: Marry Me | Music Review". Slant Magazine. Slant Magazine. Retrieved 24 April 2012. ^ "St. Vincent – Music". ILoveStVincent.com. Retrieved 2007-08-04. ^ "Pitchfork Guest List: St. Vincent". Pitchfork Media. Retrieved 2013-12-27. ^ Ryzik, Melena (May 7, 2009). "I Like Things That Are Unsettling". New York Times: C1. Retrieved January 18, 2014. ^ Pinnock, Tom (January 2015). "Album by Album: St Vincent". Uncut: 54. This page was last edited on 24 October 2018, at 18:53 (UTC).